It cannot have escaped anyone’s notice that Brother MacDonald has shown up in almost every area of my public view; my Blog, my Facebook, in my hands as books, and in my speaking. It is not because I consider him above my Lord. Just that without a doubt he sat with Him often and if Yeshua (Jesus) ever had a Commentary, I believe he gave it to MacDonald. That’s a huge thing to say, I know. Yet its the best way I know of to “paint the picture” if you will. I have found no error in his writings as they reflect and bring to life the very written Word of God. My guess is that even now Brother Paul who wrote so much of the New Testament and Brother MacDonald take long walks discussing the mind verses heart, works verses faith (trust), and belief verses obedience. All the while, like those men on the road to Emmaus, Yeshua, Himself walks along with them. If, like so much of Brother MacDonald’s style in fiction writing, I could have a brother “interpret” or narrate my daily goings and comings; I would without hesitation choose him. Him, being my second choice, as Yeshua, Himself, and no other will suit me! But given the choice of another human being such as myself (fallen yet saved by the Shepherd Yeshua), Brother George would be my choice. I know many great authors and men of God. I say without hesitation, I don’t own a “bad” book. All of which would do as a replacement to MacDonald, but chiefly I say his are the most irreplaceable! To be clear; if some crisis were to send me fleeing from my house, my Bible would be the most important book in urgency in my mind to “grab”. In no way would ANY other book or it author take precedence over the Book of Life! A very respected author and pastor I frequently “sit with” once said “Scripture is no longer being written”. For which, I will say “I emphatically do not agree!” Going so far as to say that every author of every book on “my shelves” has been inspired by the same Spirit that wrote the very Scriptures. That “God has not decided to include them” is mans opinion. Since it was man who decided what to call the Bible or not. Though I do not believe ANYONE but God has/had the final say! God will not suffer man to be in charge of His Word! If the God of the universe is speaking in a flower, bird, tree, or person, He is speaking still from every avenue and in every “audible” good to be found! He will never be anything but found! If the heart of His creature is truly seeking Him, that is! 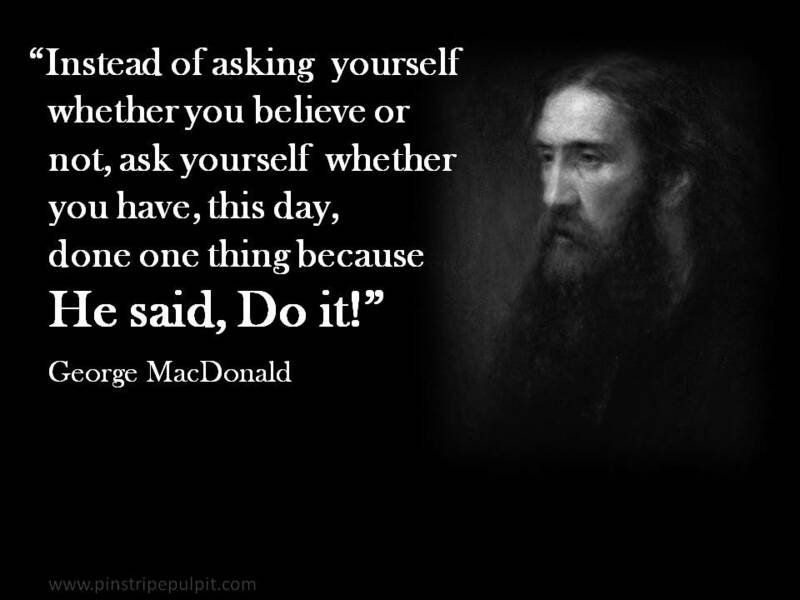 George MacDonald books can be found today, thanks in large part to God through authors that still reflect his works. Though they can be very hard to acquire. I found one of his priceless children’s book’s at a used book store for $10, the same book is being sold through Amazon for upwards of $600. Michael Phillips in partner with Bethany House Publishers has made his books quite accessible. I will say if you pick up a George MacDonald book, you will: have made a friend, chew each word as if you have never read one, and want more than anything to know Yeshua (Jesus) in the same way he did! What better legacy can one who lives, walks, writes, paints, ….breathes, what better can one leave than the Carpenter’s invitation to “Come, follow Me”? Brother MacDonald has an open invitation to post on this blog. I pray his legacy be found within those postings…that you and I will hear, see, touch, and smell the fragrance of the Spirit that inspired his work. This Yeshua, Jesus, Son of the Father who delights to take us ever closer to Him and whose work is to unite us to Him! There is no book I would exclude from recommending one read either written by George MacDonald or about. I cannot say this about any other author I have ever encountered. As Daniel in the Bible, I have not found any ill or disreputable thing written about him. Even C.S. Lewis had his critics! Sadly Yeshua Himself, has been written in more contradiction than any one who has ever walked the face of the earth! And by many who call themselves His child! You will find the real Yeshua in MacDonald’s work, 100% of the time. Only the Word of God can boast such a statement, hence why I have taken the time to write this recommendation and reason for this Brother’s work showing up in every crack and surface of the clay pot of my own writing. I am but one very small voice that shouts his work. It is no consequence that I do. As always, the burden of “proof” lies within your own experience. I pray you will give MacDonald “a go” and see if my praise rings more highly than it should :-). I may not read much but I am inspired with every post I read here.I have no doubt He is working through you. Thank you faithful sister.